Convert PDF to stylish and interactive flipping e-Magazine! PDF to flash magazine is a standard flip book maker. It gives you an easy way to convert plain PDF documents to flash pageflip digital magazine! Support colorful bookmark tabs navigation. 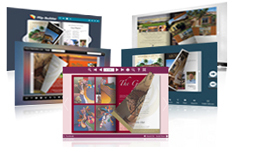 PDF to Flash Magazine can create realistic page flipping e-Publications including E-books, E-Magazine, E-Brochures, E-Catalogs, E-Reports and E-Newsletters from PDF. It will help you quickly convert pdf to flipbook for the ipad, iPhone,and Android mobiles, and bring realistic page flipping experience to your users . Moreover, you can use the software online, offline( on your PC,Pad etc), burn flash flip book to a CD/DVD or use it with an USB device. 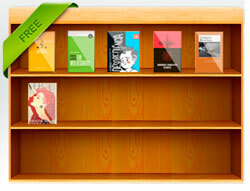 New template for PDF to flash book software is new available! This is the free template of Ancient Egypt style for online magazine software. Here are the 6 benefits of using PDF to Flash Magazine page flip software! Firstly, import PDF file to the software. Original contents include hyperlinks, table of contents and search feature are protected. Secondly, select a flipping book template. You can choose one from the pre-design templates and themes we update online. Thirdly, output your digital magazine as HTML/EXE/ZIP/APP format. 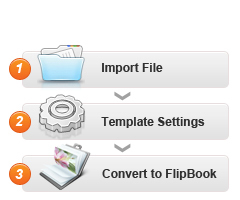 You can upload the created HTML pdf to flipbook online directly in the software without output. If there are many PDF files, the Batch Convert feature will be helpful. Preview your design in the flash window of the software. Open the APP flash book directly without extra player in the Mac OS. Free conversion. 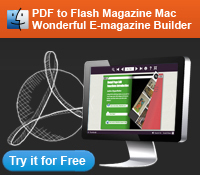 Once you have purchased our software, you can convert unlimited PDF files to flash magazine. No any extra money will be required any more. Free update. You can enjoy free update service whenever there is a newer version. 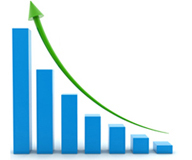 Our company will continue to update new features to meet your needs. Free support. Anytime you have question about using the software, please feel free to contact us. You can Add Audio Narration to each page of your flipbook. Just edit audio text and our software will generate audio file for you automatically. This feature is helpful for people who want to publish story e-book for children, presentation for meeting, and online learnning book. Bookcase model is embedded into the PDF to Flash Magazine. All page flipping books you upload onto our service will be collected automatically and display in the bookcase. You are allowed to design your own bookcase freely. The professional bookcase will show company information, book thumbnails with prices, and more. 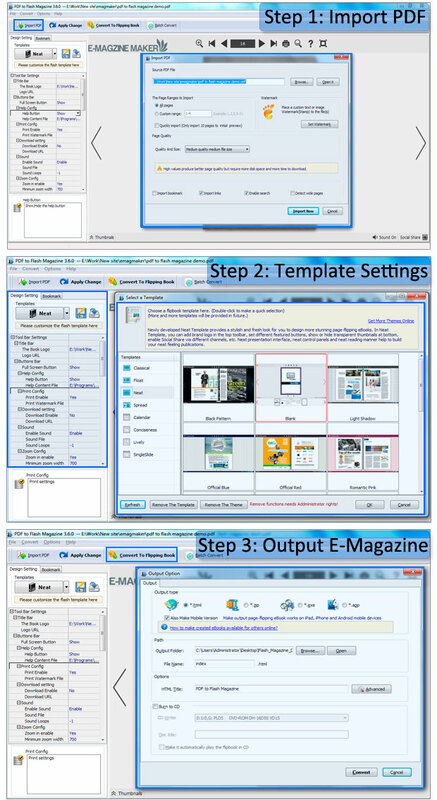 You can create flash flip book from your brochures and magazines. It will give your customers a good visual effect. Then a good impression will help to keep your clients and attract new customers. Many of our clients have expressed that they had got benefits from using the PDF to flash magazine software. What’s more, you can increase distribution of your HTML flipbook by completing the Meta setting for it. And the Google analytics tool will help to tracking your content effectively. PDF to Flash Magazine is low-cost, simple and quick-to-learn software that allows editors and publishers to produce professional page-flipping Flash Books easily on PC. And PDF to Flash Magazine is proven software that has now been successfully used and continuously updated over the past 3 years. PDF to Flash Magazine is very easy to operate. Just import the PDF file into the program, then an amazing flash page-flipping magazine will be created with your personal designs. Furthermore, you can import your previous projects directly. And also you may download free themes to use in the program. Import hyperlinks, bookmarks and text content from original PDF files. Readers can click the hyperlinks to go to web pages directly, or email you by your email links. The bookmarks help to browse digital catalogues conveniently. And Enable Search feature makes it easy to find specific information in a quick way. 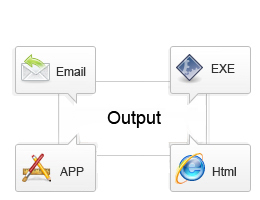 *.html allows you to upload online or view offline; *.zip is easy to send by email; *.exe is single executable file for you to run on PC individually; *.app is executable format for you to run on Mac individually. Besides PC and Mac users, mobile devices like iPhone, iPad and Android holders also can view your flash pageflip eBook with ease. What a pleasure time it is to read the virtual digital magazine on tablet devices. The Mobile Version brings considerable convenience to your customers and readers. PDF to Flash Magazine add the Google Analytics feature which can help you to collect, measure, and analyze your published magazine visiting data. You can do market & business research to be more prepared to design better-targeted web pages, strengthen your marketing initiatives and create higher converting websites. With Email and social share button enabled in PDF to Flash Magazine, anybody who read your books online can share your flipping magazines with friends and clients via Email, FaceBook, Twitter, Google, Yahoo, Digg, etc. In PDF to Flash Magazine, you can either choose template from default integrated samples, or download more published ones from our website. 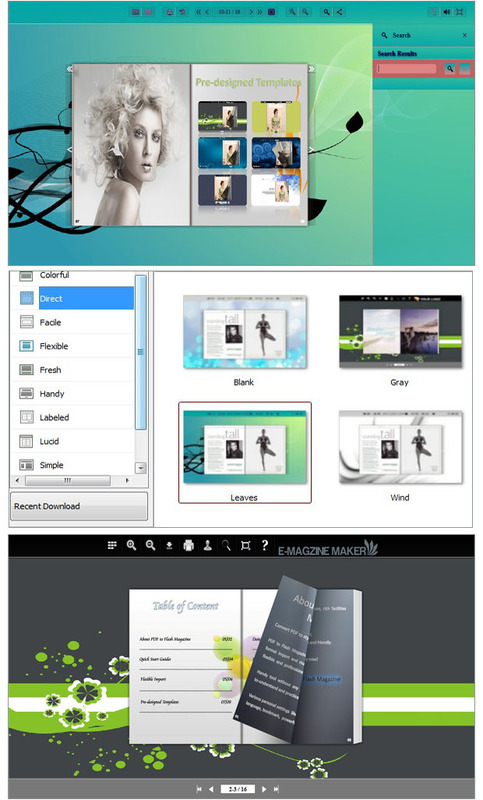 Each template offers a set of pre-designed themes. And more free themes will be published online by eMagMaker. It is very complex to get the product location in you page-flipping pdf to flipbook , even though you know its item number. With full-text search function, you can turn to product page by inputting related keyword in search engine quickly. It doesn’t matter if you or your clients are not English users, the software enables languages switch to meet your needs. We have embedded several common languages such as English, Chinese, Korean, Italian, Turkish, Spanish, Arabic and Turkish into it. You	can also	add and define your own languages. 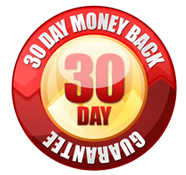 Do you want to embed a mini page-flipping flash magazine demo on existing web page to promote you product? With using the PDF to Flash Magazine, you can create product catalog or digital magazine and embed it into webpage. But to use this feature, please remember to choose HTML as the output type. Tool Bar Settings to control the title and buttons on tool bar; Flash Display Settings to manager page-flipping magazine background, display position, margin, etc; Flash Control Settings is to control security and so on. Book font looks small to read on screen? Don't worry. PDF to Flash Magazine provides full screen mode for users. Besides, zoom in scale can be defined, and different zoom in levels can be used while reading. More considerate digital reading experience is brought to customers by using the wonderful eBook builder. Delay your book editing work to another day? No problem. Just save your current file and template settings as a project, import and edit again later. Want to save your carefully designed book style to use in later publications? No problem. Just export the template settings as your own theme, then import into Template to use directly. If you think your page-flipping magazine are private documents and you just want share with your friends that trust, you can use flash control settings to set the security to protect you private document or every single catalog page! Batch Convert Mode of PDF to Flash Magazine does exactly what its name suggests. It enables you to easily convert multiple PDF files at a click of a button, and quickly convert to many separate digital Flash magazines or just a merged eBook, no other additional merge tool is needed.